•	Are you dissatisfied with your life? •	Are you overwhelmed with obligations to everyone else but you? •	Do you want more time to yourself? •	Are you confused about your purpose? •	Are you worried about the future? •	Do you feel unhappy at work? •	Are you seeking peace and quiet? •	Are you feeling depressed and powerless in your life? •	Do you feel like life is passing you by? Trust me, I've tried and failed many times! I was addicted to the snooze button and lost momentum when I slept in on the weekends. I couldn't keep the habit and went on Amazon looking for morning routine books. Sound familiar? 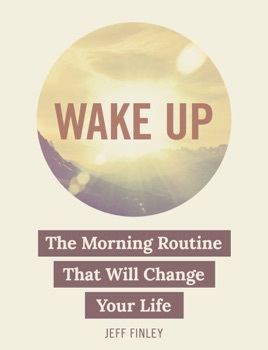 There are lots of books out there about waking up early and habit change. What you get withWake Up is a personal story of how someone just like you put all the advice into practice and saw massive change in his life. It's real, it's honest, it's inspirational. Let me stop you there, friend. I know what you're going to say. You don't have time, right? You are already get too little sleep and there is NO WAY you could possibly wake up early. Maybe you have kids or family obligations that make it difficult to carve out time for yourself. All I can say is I hear you loud and clear. But this isn't the only excuse I've heard. Fortunately, I help you with all these excuses and more in Wake Up. After reading the book, you will have no excuses left! Now's the time to take action my friend! Procrastination is a symptom of a deeper problem. Sometimes we just can't keep a good habit going or we just can't get started. Learn why. Depression is a symptom of a stifled soul that cannot express it's true gifts. Put the power of your life back into your hands and create the life you desire.